Thirty-one-year-old welterweight Derrick Krantz has been competing in mixed martial arts longer than most. Last Friday night, Dana White validated all the blood, sweat, and tears Krantz has poured into the sport. After a short tenure as an amateur competitor, Krantz made the jump to the professional ranks in 2008. Battling the who’s who of welterweights on the Texas regional scene. Krantz’s opponent list is impressive. Even though he has ten losses on his record, they’ve nearly all come to notable names including Dustin Poirier, Andrey Koreshkov, Derek Campos, and James Nakashima. 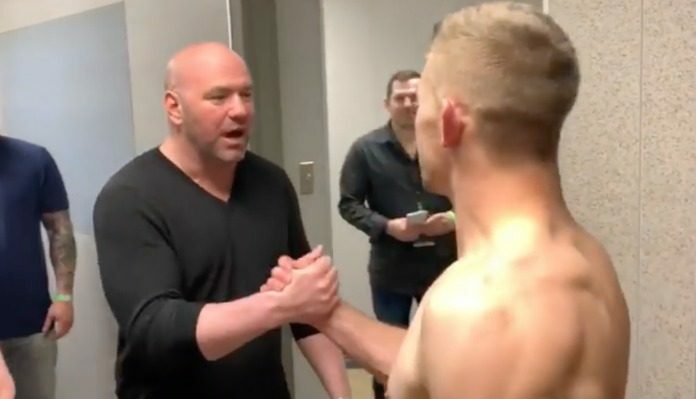 After knocking out his opponent in devastating fashion, a fired-up Krantz ran into UFC President Dana White in the back. His electric attitude earned the 34-fight veteran a shot on Dana White’s Tuesday Night Contender Series. To the best of the public’s knowledge, Krantz doesn’t have an opponent or date for his UFC opportunity, yet. When he gets there, the 31-year-old will have to put on an encore performance in order to earn a UFC contract. Do you think Dana White will wind up signing it?